Been reading sci-fi for 55 years and this is good. Is there going to be more in the series, if it is a series. Good book but I tthink that it would make a better movie, or better yet, a mini series. will there be more books in a series? Yes. #2 is done. #3 is in the works. And there are plans for 2 others, one Earl Harbinger book and one Agent Franks book. Any word on a publication date for #2? I’ve read #1 probably 4 or 5 times (and probably still have at least a couple more re-readings in my future), but I’m definitely ready for more. MHV will be out October 2nd, 2010. Well, I’ll be among those eagerly awaiting it. Loved the book. read it in one sitting while here in Iraq. When is the second book coming out? MUST have it. Thanks for writing this. Hey Larry, I just got done reading MHI. Dude, it rocked and I want patch. How do I get one????? Wally, send me an address to send one to. I want a patch too…It would look great on my shooting bag! Best series in a long time! Is there any way to order a patch? It would look badass on my uniform. I absolutely loved MHI. I’m reading it again for the third time to get myself refamiliarized with the characters and story before Vendetta comes out. 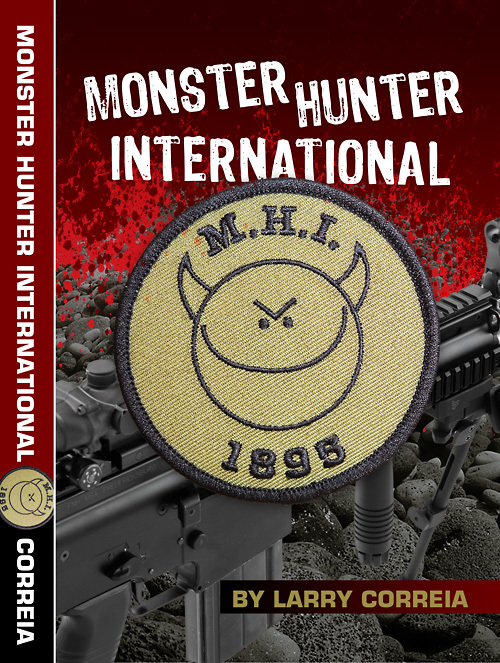 I don’t know if anyone has mentioned this before, but I’d love to see a prequel to MHI… the story of how Raymond “Bubba” Shackleford started BUBBA SHACKLEFORD’S PROFESSIONAL MONSTER KILLERS. Can’t wait for Monster Hunter Alpha and the Grimnoir Chronicles. I’m not sure what the legalities of it would be, but, I’d like to try my hand at adapting the MH-verse into a roleplaying game. Ish, if it is just your personal use, have fun. There are tons of people doing MH based role playing games on thier own. I think that’s great. If you’re going to develop it to sell and make a profit, then you’d have to buy the rights. Your books rock, and it’s nice to see Big Dots getting some respect. Rock on, my credit card is locked and loaded for book #3’s release. Larry,I really loved the first three books. My brother lent me his MHI, it ended up he bought all 3 on Kindle and I bought 2 & 3 in paperback. Any news on release release date of Legion in Paperback format? I will probably go back and buy all 4 in Hardcover anyway.